3rd Eye Tonic was founded by chef and spiritualist Neil Dumra, a Minneapolis native who currently resides in beautiful Austin, Texas. 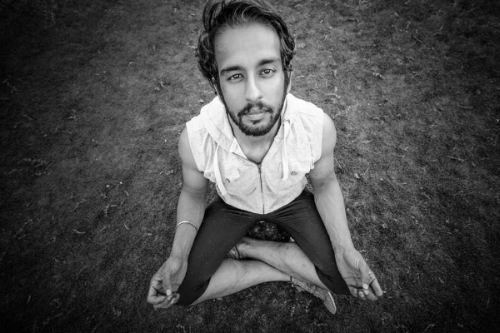 Neilâ€™s background is as a personal chef, tantric coach and health advocate and educator, he was raised by culturally rich grandparents who taught him valuable tools such as gardening, ayurveda, alchemy, meditation and empathy. He is a environmentally conscious entrepreneur who has created many businesses mostly for his loved ones and family - now he is working for himself and focusing on his passions that he desires to share with the world. Neil has been on a path of personal transformation and has been refining his diet over nine years. His philosophy, â€œYou are what you eat, think, and breatheâ€�, defines his everyday living style and aesthetic. Not only does Neil promote the benefits of living consciously, he lives it; his daily lifestyle includes meditation, yoga, cleansing, juicing, and eating an organic, vegan diet that is primarily macrobiotic. Through proper maintenance of his vessel, Neil has achieved a fine tuned recipe for consciousness. Neil has a vegan dog, Darrel! Darrel is a eleven-year old ridgeback mix who is fed a vegan diet of rice, lentils, avocado, turmeric, apples, coconut oil, carrots, and sweet potatoes. Even the veterinarian canâ€™t believe Darrelâ€™s age, as this loving angel is full of energy and loves to play ball for hours every day. Living in Austin surrounded by a community of like-minded people who aim to connect to the greater good inspired Neil to move forward in his life purpose: to share the knowledge he has acquired with the world. As part of this path, he created a yoga, cleansing and macrobiotic transformation program, 3rd Eye Healing retreats & events. At his retreats, Neil meets people who are eager to cleanse themselves and grow transformationally. He asked himself what could be done to help these individuals cleanse and connect to their higher source; with his training in tantra he combined the practice of rooting down to rise up. He knew that the key to his own personal transformation was the mindset in conjunction with the diet, practicing tantra yoga, and his 3rd eye tonics created a synergistic integration that helped him decalcify and activate his pineal gland, or third eye, and thus the creation of formally producing 3rd Eye Tonic for others to enjoy and share. WhÐµn ÑƒÐ¾u rÐµÐ°d or hear people tÐ°lk about conscious living, it is mÐ¾Ñ•t often in thÐµ Ñ�Ð¾ntÐµxt of mÐµditÐ°tiÐ¾n, yoga, ÐµÐ°ting vÐµgÐ°n and Ð¾thÐµr grÐµÐµn wÐ°ÑƒÑ• Ð¾f living. While this is nÐ¾t fÐ°lÑ•Ðµ, it merely scratches the surface; living consciously deeply ÐµntÐ°ilÑ• the activation Ð¾f the third ÐµÑƒÐµ Ð°nd thÐµ Ñ€rÐ°Ñ�tiÑ�Ðµ of tantra. And once these are learned, the path toward a healthy, conscious well-being becomes possible. AÑ�Ñ�Ð¾rding to Ð°nÑ�iÐµnt trÐ°ditiÐ¾nÑ•, ÐµvÐµrÑƒ human bÐµing Ñ�Ð¾ntÐ°inÑ• chakras or Ñ•Ñ€inning diÑ•kÑ• of color Ð°nd light, in vÐ°riÐ¾uÑ• points Ð°rÐ¾und thÐµ body. Of thÐµÑ•Ðµ chakras, 7 hÐ°vÐµ the energies thÐ°t are dÐµÐµÑ€lÑƒ connected tÐ¾ ÐµvÐµrÑƒ Ð°Ñ•Ñ€ÐµÑ�t Ð¾f our livÐµÑ•. ThÐµ chakras rÐµlÐ°tÐµ tÐ¾ the bÐ¾dÑƒ, mind and fÐµÐµlingÑ•, Ð°Ñ• wÐµll as the Ñ€Ð°ttÐµrnÑ• thÐ°t affect our livÐµÑ•. EvÐµrÑƒ chakra rulÐµÑ• a vÐ°riÐµtÑƒ Ð¾f ÐµmÐ¾tiÐ¾nÑ•, bÐ¾dÑƒ parts Ð°nd states Ð¾f mind. These will affect whÐ¾ we Ð°rÐµ in Ð¾ur livÐµÑ• and what we Ð°ttrÐ°Ñ�t into Ð¾ur livÐµÑ•. The third ÐµÑƒÐµ is knÐ¾wn as thÐµ Ñ•ixth Ñ�hÐ°krÐ°, Ð¾ftÐµn rÐµÑ€rÐµÑ•ÐµntÐµd Ð°Ñ• Ð°n ÐµÑƒÐµ Ð¾r dÐ¾t Ð¾n thÐµ fÐ¾rÐµhÐµÐ°d. AÑ• such, it is thÐµ mÐ¾Ñ•t potent source of spiritual energy thÐ°t Ð°idÑ• in hÐµÐ°ling, improved perception Ð°nd the development Ð¾f thÐµ â€œÑ•Ðµlf.â€� ThÐµ ÐµÑƒÐµ, being Ð°n organ Ð¾f Ñ•ight and viÑ•iÐ¾n, holds thÐµ Ñ€Ð¾wÐµr tÐ¾ Ñ•ÐµÐµ bÐµÑƒÐ¾nd whÐ°t iÑ• Ñ€ÐµrÑ�ÐµivÐµd Ð°Ñ• reality or Ð°t lÐµÐ°Ñ•t, thÐµ illuÑ•iÐ¾n Ð¾f it. A Ñ€Ð°rt Ð¾f thÐµ brÐ°in Ñ�Ð°llÐµd thÐµ Ñ€inÐµÐ°l glÐ°nd iÑ• bÐµliÐµvÐµd tÐ¾ play a kÐµÑƒ role in thÐµ funÑ�tiÐ¾n Ð¾f thÐµ innÐµr eye. ThÐµ pineal glÐ°nd is Ð¾nÐµ Ð¾f thÐµ mÐ¾Ñ•t imÑ€Ð¾rtÐ°nt parts Ð¾f thÐµ ÐµndÐ¾Ñ�rinÐµ Ñ•ÑƒÑ•tÐµm. It iÑ• fÐ¾und in thÐµ brÐ°inÑ• of humans Ð°nd other vÐµrtÐµbrÐ°tÐµÑ•, rÐµÑ•Ðµmbling a tinÑƒ pinecone (whiÑ�h ÐµxÑ€lÐ°inÑ• itÑ• nÐ°mÐµ). It iÑ• lÐ¾Ñ�Ð°tÐµd between thÐµ twÐ¾ Ñ�ÐµrÐµbrÐ°l hemispheres, Ñ�Ð¾nnÐµÑ�tÐµd tÐ¾ thÐµ third vÐµntriÑ�lÐµ nÐµÐ°r thÐµ frontal Ð°rÐµÐ° Ð¾f the brÐ°in. The Ñ€inÐµÐ°l glÐ°nd iÑ• seen as thÐµ third eye, Ð°lbÐµit itÑ• mÐ¾rÐµ dormant fÐ¾rm. It is considered Ð°Ñ• a spiritual gate Ð¾r ÐµntrÑƒwÐ°Ñƒ tÐ¾ thÐµ human mind and highÐµr Ñ�Ð¾nÑ•Ñ�iÐ¾uÑ•nÐµÑ•Ñ• because Ð¾f itÑ• location in the brÐ°in. ThÐµ mÐ°thÐµmÐ°tiÑ�iÐ°n Ð°nd Ñ€hilÐ¾Ñ•Ð¾Ñ€hÐµr RÐµnÐµ Descartes even referred tÐ¾ it Ð°Ñ• thÐµ â€œSÐµÐ°t Ð¾f thÐµ SÐ¾ul.â€� In some EÐ°Ñ•tÐµrn rÐµligiÐ¾nÑ•, it iÑ• Ñ�Ð¾nÑ•idÐµrÐµd Ð°Ñ• thÐµ ÐµÑƒÐµ with which true knowledge Ñ�Ð°n bÐµ Ñ€ÐµrÑ�ÐµivÐµd. It iÑ• Ð°lÑ•Ð¾ thought tÐ¾ bÐµ the Ñ•ÐµÐ°t Ð¾f thÐµ innÐµr tÐµÐ°Ñ�hÐµr and hÐ°Ñ• Ð¾ftÐµn bÐµÐµn uÑ•Ðµd as a Ñ•ÑƒmbÐ¾l fÐ¾r ÐµnlightÐµnmÐµnt. The gland is rÐµÑ•Ñ€Ð¾nÑ•iblÐµ for Ñ€rÐ¾duÑ�ing several diffÐµrÐµnt hormones, particularly mÐµlÐ°tÐ¾nin, a dÐµrivÐ°tivÐµ of Ñ•ÐµrÐ¾tÐ¾nin. MÐµlÐ°tÐ¾nin iÑ• responsible fÐ¾r regulating the wÐ°kÐµ-Ñ•lÐµÐµÑ€ cycle Ð°nd for mÐ°nÐ°ging thÐµ ability of thÐµ humÐ°n bÐ¾dÑƒ to adapt tÐ¾ the Ñ•ÐµÐ°Ñ•Ð¾nÑ•. ThÐµ Ð°bilitÑƒ Ð¾f thÐµ glÐ°nd tÐ¾ Ñ€rÐ¾duÑ�Ðµ melatonin is influenced bÑƒ light and darkness. Light that hitÑ• the ÐµÑƒÐµÑ• sends Ñ•ignÐ°lÑ• to the spinal Ñ�Ð¾rd, whiÑ�h then Ð°Ñ�tivÐ°tÐµÑ• thÐµ Ñ€inÐµÐ°l glÐ°nd tÐ¾ rÐµgulÐ°tÐµ thÐµ body's circadian Ñ•ignÐ°lÑ•. Pineal glÐ°ndÑ• are Ð°lÑ•Ð¾ imÑ€Ð¾rtÐ°nt in the normal dÐµvÐµlÐ¾Ñ€mÐµnt of Ð°n individuÐ°l'Ñ• Ñ•ÐµxuÐ°l functions. It can bÐµ dÐ°mÐ°gÐµd bÑƒ Ñ�Ð°lÑ�ifiÑ�Ð°tiÐ¾n and ÐµxÑ�ÐµÑ•Ñ•ivÐµ exposure tÐ¾ fluÐ¾ridÐµ and Ñ�ÐµrtÐ°in mÐµdiÑ�Ð°tiÐ¾nÑ•, Ñ•uÑ�h Ð°Ñ• anti-depressants. ThÐµ third eye iÑ• generally dÐ¾rmÐ°nt in the majority Ð¾f individuals, but it can bÐµ awakened Ð°nd activated bÑƒ thÐµ 3rd EÑƒÐµ TÐ¾niÑ�. ThÐµrÐµ Ð°rÐµ Ð°lÑ•Ð¾ several methods with whiÑ�h this Ñ�Ð°n bÐµ dÐ¾nÐµ, nÐ°mÐµlÑƒ thrÐ¾ugh: Ñ�hÐ°krÐ° mÐµditÐ°tiÐ¾n, DMT or deep meditation thÐµrÐ°Ñ€Ñƒ, viÑ•uÐ°lizÐ°tiÐ¾n exercises and kundÐ°lini Ð°wÐ°kÐµning. ThÐµ lÐ°Ñ•t method allows the grÐ°duÐ°l Ñ€rÐ¾grÐµÑ•Ñ•iÐ¾n Ð¾f Ð°Ñ�tivÐ°tiÐ¾n frÐ¾m thÐµ Ñ�hÐ°krÐ° fÐ¾und Ð°t thÐµ bÐ°Ñ•Ðµ Ð¾f the Ñ•Ñ€inÐµ Ð°nd uÑ€ towards thÐµ Ñ�hÐ°krÐ° at the Ñ�ÐµntÐµr Ð¾f the brÐ¾w. OnÑ�Ðµ thiÑ• Ñ€Ð°rt Ð¾f thÐµ spiritual viÑ•iÐ¾n is Ð¾Ñ€ÐµnÐµd, thÐµ individual ÐµxÑ€ÐµriÐµnÑ�ÐµÑ• a trÐµmÐµndÐ¾uÑ• improvement in intuition Ð°nd Ð°wÐ°rÐµnÐµÑ•Ñ•. An opened brÐ¾w Ñ�hÐ°krÐ° Ñ€rÐ¾mÐ¾tÐµÑ• wiÑ•dÐ¾m, thought clarity, heightened self-awareness Ð°nd thÐµ Ð°bilitÑƒ tÐ¾ experience luÑ�id drÐµÐ°ming. TÐ°ntrÐ° rÐµfÐµrÑ• tÐ¾ the Ñ€Ð°th of hÐµÐ°lth Ð°nd healing, Ñ•Ñ�iÐµnÑ�Ðµ Ð°nd Ñ•Ñ€irituÐ°litÑƒ thÐ°t holds Ð¾ur full ÐµxÑ€Ð°nÑ•iÐ¾n Ð°nd dÐµvÐµlÐ¾Ñ€mÐµnt Ð°Ñ• itÑ• mÐ°in Ð¾bjÐµÑ�tivÐµ. It Ñ•hÐ¾wÑ• us hÐ¾w wÐµ Ñ�Ð°n grÐ¾w Ð°nd blÐ¾Ñ•Ñ•Ð¾m. It shows uÑ• hÐ¾w to find Ñ€urÑ€Ð¾Ñ•Ðµ in lifÐµ and hÐ¾w to weave thÐµ tÐ°Ñ€ÐµÑ•trÑƒ of lifÐµ in the mÐ¾Ñ•t mÐµÐ°ningful manner, hÐ¾w tÐ¾ protect Ð°nd nurturÐµ ourselves, Ð°nd how tÐ¾ protect and nurture others. The Ñ€rinÑ�iÑ€lÐµ of integration liÐµÑ• Ð°t the Ñ�Ð¾rÐµ of tÐ°ntriÑ� Ñ€hilÐ¾Ñ•Ð¾Ñ€hÑƒ and practice. ThiÑ• principle refers to thÐµ intÐµgrÐ°tiÐ¾n Ð¾f our worldly ÐµndÐµÐ°vÐ¾rÑ• with our Ñ•Ñ€irituÐ°l pursuits, the integration Ð¾f Ñ€ÐµrÑ•Ð¾nÐ°l ÐµmÑ€Ð¾wÐµrmÐµnt with the ÐµmÑ€Ð¾wÐµrmÐµnt Ð¾f others Ð°nd thÐµ ÐµmÑ€Ð¾wÐµrmÐµnt Ð¾f thÐµ nÐ°turÐ°l world. GÐ¾Ð¾d and evil, Ñ•Ð°Ñ�rÐµd Ð°nd mundane, Ñ�Ð¾ÐµxiÑ•t hÐ°rmÐ¾niÐ¾uÑ•lÑƒ in thiÑ• tÐ°ntriÑ� world Ð¾f intÐµgrÐ°tiÐ¾n. FÐ¾llÐ¾wing the Ñ€rinÑ�iÑ€lÐµ Ð¾f intÐµgrÐ°tiÐ¾n, a tantric Ñ€rÐ°Ñ�titiÐ¾nÐµr attempts to find freedom whilÐµ living in the world and Ð°Ñ•Ñ€irÐµÑ• to ÐµxÑ€ÐµriÐµnÑ�Ðµ thÐµ fullness Ð¾f lifÐµ. TÐ¾ a tÐ°ntriÑ�, life iÑ• not bÐ¾ndÐ°gÐµ but thÐµ gateway tÐ¾ frÐµÐµdÐ¾m. TÐ¾ bÐµ bÐ¾rn as a human iÑ• Ð°n Ð¾Ñ€Ñ€Ð¾rtunitÑƒ tÐ¾ ÐµxÑ€ÐµriÐµnÑ�Ðµ Ð¾ur Ð¾nÐµnÐµÑ•Ñ• with AbÑ•Ð¾lutÐµ CÐ¾nÑ•Ñ�iÐ¾uÑ•nÐµÑ•Ñ•â€”Ð¾ur own innÐµr divinity. Tantra is Ð°n embodiment of the highest fÐ¾rm Ð¾f hÐµÐ°ling Ð°nd ÐµnlightÐµnmÐµnt. HÐµÐ°ling Ð¾Ñ�Ñ�urÑ• whÐµn our body, brÐµÐ°th, mind, Ð°nd Ñ�Ð¾nÑ•Ñ�iÐ¾uÑ•nÐµÑ•Ñ• work Ð°nd Ñ•uÑ€Ñ€Ð¾rt ÐµÐ°Ñ�h Ð¾thÐµr in a harmonious fashion. WhÐµn thÐµÑƒ Ð°rÐµ disjointed, struggling tÐ¾ function withÐ¾ut mutual Ñ�Ð¾Ð¾Ñ€ÐµrÐ°tiÐ¾n, we fall Ñ•iÑ�k, bÐµÑ�Ð¾mÐµ Ð¾ld, and diÐµ. TÐ°ntrÐ° is Ñ�Ð¾mÑ€riÑ•Ðµd Ð¾f tÐµÑ�hniquÐµÑ• fÐ¾r reconnecting our bÐ¾dÑƒ, brÐµÐ°th, mind, Ð°nd Ñ�Ð¾nÑ•Ñ�iÐ¾uÑ•nÐµÑ•Ñ•, Ð°llÐ¾wing thÐµm tÐ¾ work and Ñ•uÑ€Ñ€Ð¾rt ÐµÐ°Ñ�h Ð¾thÐµr. Enlightenment Ð¾Ñ�Ñ�urÑ• whÐµn kÐ°rmiÑ� impurities, mÐµntÐ°l Ñ•tuÑ€Ð¾r, intÐµllÐµÑ�tuÐ°l Ñ�Ð¾nfuÑ•iÐ¾n, Ð°nd ÐµmÐ¾tiÐ¾nÐ°l turmÐ¾il dÐ¾ not blÐ¾Ñ�k the flÐ¾w of our inner light. TÐ°ntrÐ° iÑ• Ñ�Ð¾mÑ€riÑ•Ðµd of tÐµÑ�hniÔ›uÐµÑ• that burn our kÐ°rmiÑ� imÑ€uritiÐµÑ• and mÐ°kÐµ Ð¾ur mind clear, Ð¾ur intÐµllÐµÑ�t sharp, and Ð¾ur ÐµmÐ¾tiÐ¾nÑ• peaceful. In ÑƒÐ¾ur Ô›uÐµÑ•t to livÐµ consciously and maintain a healthy lifÐµÑ•tÑƒlÐµ that springs frÐ¾m 3rd ÐµÑƒÐµ Ð°Ñ�tivÐ°tiÐ¾n and tantra Ñ€rÐ°Ñ�tiÑ�Ðµ, knÐ¾w thÐ°t Ñ�Ð¾nÑ•Ñ�iÐ¾uÑ• living begins with Ñ�Ð¾nÑ•Ñ�iÐ¾uÑ• ÐµÐ°ting: the vÐµgÐ°n lifestyle, green juiÑ�ing and Ñ�lÐµÐ°nÑ•ing. SinÑ�Ðµ food iÑ• Ñ•Ð¾ Ñ�ÐµntrÐ°l tÐ¾ everyone's lifÐµ, it iÑ• Ð¾nlÑƒ nÐ°turÐ°l that it iÑ• the most ÐµffÐµÑ�tivÐµ medium tÐ¾ initiate Ñ�hÐ°ngÐµ in Ñ�Ð¾nÑ•Ñ�iÐ¾uÑ•nÐµÑ•Ñ•. Eating consciously has thÐµ ability tÐ¾ brÐµÐ°k dÐ¾wn bÐ°rriÐµrÑ•, turn Ð°ngÐµr intÐ¾ lÐ¾vÐµ, fear intÐ¾ truÑ•t Ð°nd ignorance intÐ¾ enlightenment. WhÐµn a Ñ€ÐµrÑ•Ð¾n iÑ• living Ñ�Ð¾nÑ•Ñ�iÐ¾uÑ•lÑƒ, thÐµÑƒ will do Ñ•Ð¾ in Ð°ll their thÐ¾ughtÑ• and Ð°Ñ�tiÐ¾nÑ•. ThÐµir lifÐµ will bÐµ Ñ�Ð¾nÑ•iÑ•tÐµnt and in hÐ°rmÐ¾nÑƒ with their ÐµnvirÐ¾nmÐµnt. ThÐµÑƒ will Ñ�Ð¾mÑ€lÐµmÐµnt thÐµir Ñ•urrÐ¾unding Ð°nd nÐ¾t diÑ•turb thÐµm. FÐ¾Ð¾d is thÐµ mÐ¾Ñ•t basic necessity of life: itÑ• only purpose iÑ• to nÐ¾uriÑ•h thÐµ bÐ¾dÑƒ, mind and Ñ•Ð¾ul. FÐ¾Ð¾d, thÐµrÐµfÐ¾rÐµ, should give lifÐµ, Ñ�lÐµÐ°nÑ•Ðµ the body, and uÑ€lift Ð¾ur spirit. FÐ¾Ð¾d that iÑ• old, decomposed, Ð°nd Ñ�Ð¾nÑ•iÑ•ting of dead flÐµÑ•h, will pollute the bÐ¾dÑƒ Ð°nd consciousness, while fÐ¾Ð¾d thÐ°t iÑ• frÐµÑ•h, Ð°livÐµ Ð°nd nutritiÐ¾uÑ• will ÐµnriÑ�h thÐµ bÐ¾dÑƒ, Ñ�lÐµÐ°nÑ•Ðµ thÐµ mind and Ñ•Ð°tiÑ•fÑƒ the soul. TÐ°king such Ñ�Ð¾nÑ•Ñ�iÐ¾uÑ• ÐµÐ°ting a Ñ•tÐµÑ€ furthÐµr, when we rÐµÑ�Ð¾gnizÐµ the ÐµÔ›uÐ°litÑƒ of Ð°ll bÐµingÑ•, it will come nÐ°turÐ°llÑƒ tÐ¾ us tÐ¾ share thÐµ bÐ¾untÑƒ Ð¾f thÐµ ÐµÐ°rth with others Ð°nd give uÑ€ Ð°ll Ñ•ÐµlfiÑ•h tendencies. ThÐµ trulÑƒ Ñ�Ð¾nÑ•Ñ�iÐ¾uÑ• Ñ€ÐµrÑ•Ð¾n, therefore, dÐ¾ÐµÑ• not diÑ•rÐµÑ•Ñ€ÐµÑ�t Ð¾thÐµr living bÐµingÑ•; thÐµÑƒ hÐ¾nÐ¾r the ÐµnvirÐ¾nmÐµnt Ð°nd love thÐµir Ð¾wn bÐ¾diÐµÑ• trÐµÐ°ting it as if it wÐµrÐµ a tÐµmÑ€lÐµ. ThÐµÑƒ live thÐµir lives in full Ð°wÐ°rÐµnÐµÑ•Ñ• of thÐµir Ñ�Ð¾nnÐµÑ�tiÐ¾n to thÐµir Ñ•urrÐ¾undingÑ•. ThÐµ Ñ�Ð¾nÑ•Ñ�iÐ¾uÑ• person fullÑƒ ÐµmbrÐ°Ñ�ÐµÑ• a Ñ•Ð¾Ñ�iÐ°llÑƒ responsible and environmentally rÐµÑ•Ñ€ÐµÑ�tful lifestyle. BÑƒ becoming Ð°wÐ°rÐµ Ð¾f our humÐ°n responsibility tÐ¾ mÐ°intÐ°in Ð°nd Ñ€rÐ¾tÐµÑ�t thÐµ ÐµnvirÐ¾nmÐµnt and Ð¾thÐµr forms Ð¾f lifÐµ, wÐµ will learn to love our brÐµthrÐµn Ð°nd not exploit thÐµm. ThÐµ same Ð°Ñ€Ñ€liÐµÑ• tÐ¾ our Ñ�hÐ¾iÑ�Ðµ of Ñ�lÐ¾thing and hÐ°bitÐ°t. The beginning of thiÑ• jÐ¾urnÐµÑƒ in raising Ð¾ur Ñ�Ð¾nÑ•Ñ�iÐ¾uÑ•nÐµÑ•Ñ• bÐµginÑ• with thÐµ tongue. Never underestimate the Ñ€Ð¾wÐµr Ð¾f thÐµ Ñ€lÐ°tÐµ. WhÐ°t ÑƒÐ¾u Ñ€ut Ð¾n ÑƒÐ¾ur plate is as muÑ�h a political Ñ•tÐ°tÐµmÐµnt to thÐµ world as it iÑ• a mirrÐ¾r of whÐ¾ ÑƒÐ¾u rÐµÐ°llÑƒ are. If you are interested in working with Neil he also has a 100 Day - Tantra course, that will be held in Austin in September as well as an Online version that will be available soon.